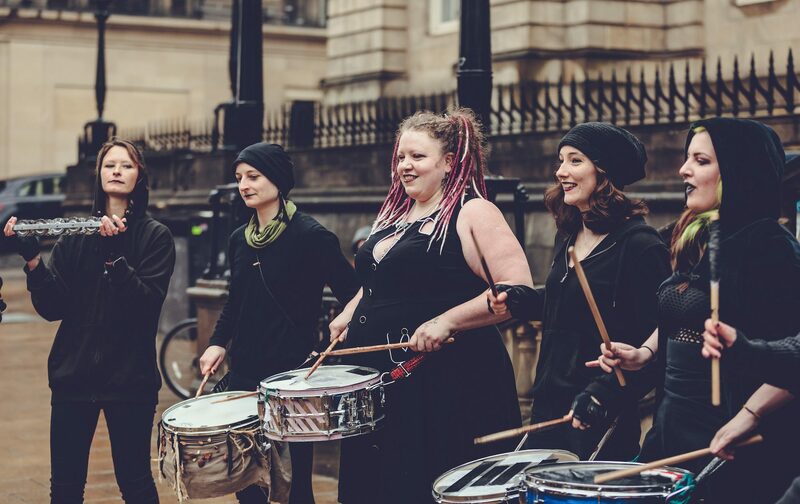 Erin has performed with BFS as a Processional Drummer and a Faerie Porter, and also served as Press Officer for Samhuinn 2014 and Beltane 2015. In the first of our new What Makes Beltane Special? series, she talks about feelings, film crews and the best seat in the house. “Right,” the woman from the BBC said, “How do we reserve the best seats so we can film everything?”. I took a deep breath, suppressed a giggle, and thought about how on earth I was going to explain. It was a month before Beltane 2015 and we were on the phone, trying to coordinate the BBC visit to get some footage of the festival for a documentary they were making. None of the team at the BBC knew much about our event, so their question was understandable, I suppose. New folk coming to see the festival as audience members probably wonder something pretty similar. But beyond ‘that’s not how it works at all’, the answer’s a bit complicated. Here’s the thing about Beltane: it’s not a play, it’s not a parade, it’s not a concert, it’s not a pyrotechnic display, it’s not a ritual. It’s too mad and big to fit any single conventional label you can imagine. It just is. There aren’t seats and the action doesn’t happen in one place. It is entirely impossible to see (or for that matter, film) ‘everything’. Everyone on the Hill for the festival has an experience that’s all their own, seeing snippets of a dozen or more different mini-performances around the Hill, having their own moments with peculiar characters face-to-face and eye-to-eye, gazing at flames flickering from an angle that no-one else shares. 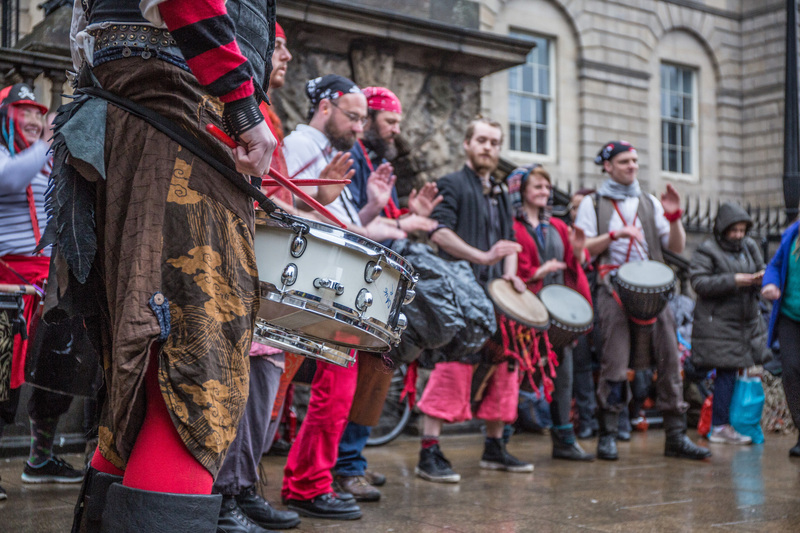 I’ve been involved in Beltane from two extremes: as part of one of the drum crews one year and coordinating PR and press for the festival the next. That first Beltane, as a Processional Drummer, was about feeling the festival: feeling the rhythms of the other drummers around me, taking in how the whole festival felt, and the feelings it brought out in me. With earplugs in and surrounded by dozens of drums, there wasn’t any room to do anything else, but it was magical. 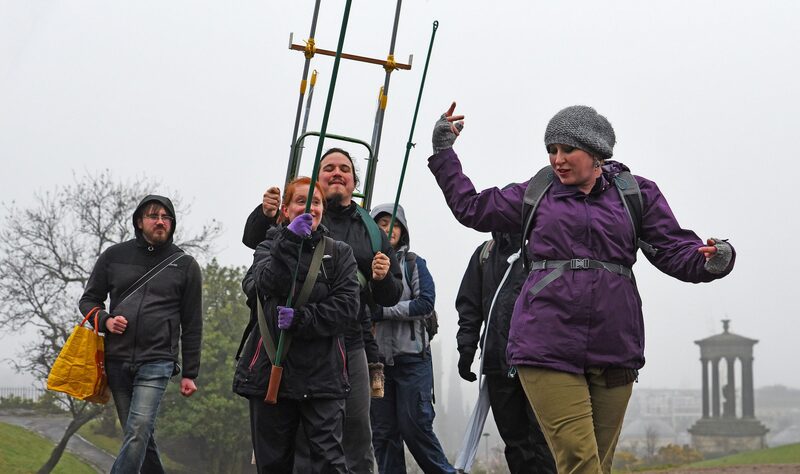 My second was about words – how to describe the festival to the BBC, other press and to the public, trying to bottle that Beltane feeling I’d experienced, to describe it in a press release and make people want to come along, to squash it into a press briefing. 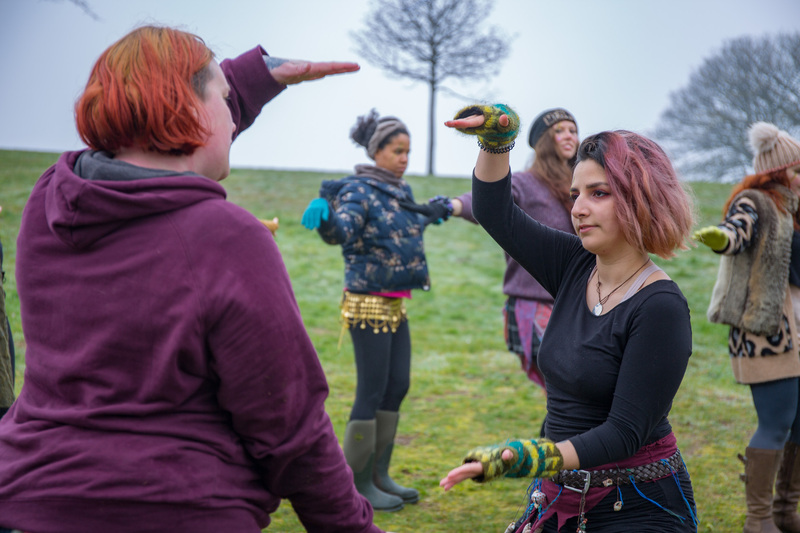 I found myself describing it with stock phrases after a while – ‘colourful costumes, fire dancers and drums!’ – and none of them could do the magic I remembered feeling at my first Beltane any kind of justice. This year it’s hit me: while we have to and will continue to try, this bizarre thing we do can’t be tamed. It can’t be described. It can only be felt, and that’s what makes it beautiful. Unlike anything else in our lives these days, it exists for its own sake. It’s not a perfectly polished and sanitised performance; there’s not a script and there’s no voiceover to tell you what’s going on, what to think or what to feel. It’s wild, earthy, vibrant and alive. It’s crafted by a community of completely mad and utterly wonderful creatures that do it because they love it, not because they have to or they should, not to pay their bills, and not because it’s expected. Beltane isn’t something you watch or perform in, or that happens in front of you and then you go home and it’s over. It’s a process that happens through you, with you, inside you. It’s about cracking the shell we’ve covered our hearts with in modern times, and connecting with something deeper, something wild and visceral. So don’t come to Beltane expecting it to explain itself. Read about it, think about what the turn of winter to summer means for you, what it means for all of us, what it has meant to the generations before us going back centuries. Then, join us on the Hill and use what you see, hear and feel to make your own festival of change. Leave the old behind; dance with joy simply because you can. Shriek like a wild thing because there’s a new year ahead filled with wonderful things. Join us and celebrate being alive. And to answer that question from right at the beginning: no need to reserve a seat, there aren’t any. But the best spot on the whole Hill will be yours. Want to come to Beltane Fire Festival 2016 on 30th April? Book your ticket HERE. Previous Share a Beltane 2016 poster selfie! Next Want to take part in Beltane 2016? Here are some groups you could join!